The lastest rest results from the I-5 Ship Canal Bridge noise panel study are in and they show little change from the February results. And that’s not good. It was hoped that the panels, which were installed on the underside of the southern end of the Ship Canal Bridge, would reduce reflected noise from the express lanes by four to five decibels. Instead, reductions of one to three decibels have been recorded. The 500-foot test section is located along Harvard E. and E. Allison. He noted that it’s possible the test is reducing express lane noise, but that other traffic noise is so loud that it gets in the way of measuring the reduction. According to the WSDOT press release, neighbors more than a block away say they have noticed a reduction in freeway noise. People who live closer have noticed less reduction. We reported on the last set of noise readings in February. Our video from June 2009 explains how the test of the noise panels will be conducted. 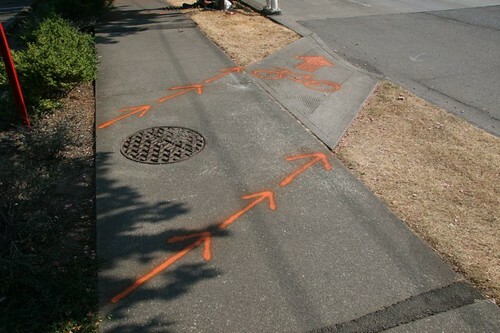 To read more on the project, go to the WSDOT’s web page. This entry was posted in Uncategorized on September 13, 2011 by cdmilton. This entry was posted in Uncategorized on September 13, 2011 by waterton. A Grumman Widgeon 2 engined amphibian has been flying off Lake Union the past few days. 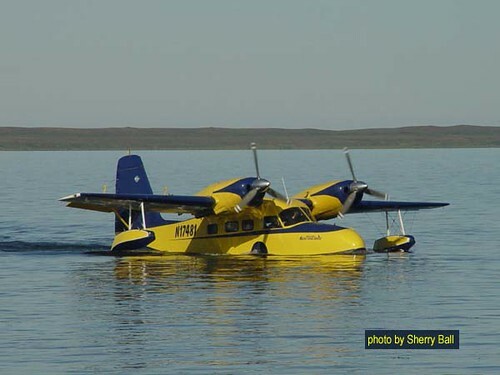 We’ve confirmed it isn’t Steve Harvey’s N17481 (built 1944) from Kodiak as pictured. Has anyone snapped a picture or recorded the N number? It was sighted in and out of Lake Union Sunday around 7:00 PM and Monday around noon. Blind Pig coming to Nettletown space: Several blogs are reporting that former Anchovies & Olives chef Charles Walpole is going in to the space on Eastlake Avenue (2238 Eastlake Ave. E.) recently vacated by Christina Choi’s Nettletown. Walpole told Seattle Eater that he expects the menu to “consist of 10 to 12 small dishes that will change every day.” There will also be a crudo or ceviche and a $35 “surprise menu” “where we just cook for that person.” No word on when he’ll open. VideoQuest closing: Eastlake’s video store (2234 Eastlake) is closing, done in by competition from the Internet, according to posters in the neighborhood. Their closing sale is on through September. They’ll be open noon to 9 p.m. until they close. Quick Stop grocery still closed: We wrote in April about the closing of the Quick Stop Deli and Grocery, 2352 Eastlake Ave. E. A sign placed in the window at the time of the closure said the grocery would be reopening soon, but we’re still waiting. A look in the door over the weekend found nothing changed. We’ll let you know if we hear anything. This entry was posted in Uncategorized on September 12, 2011 by cdmilton. 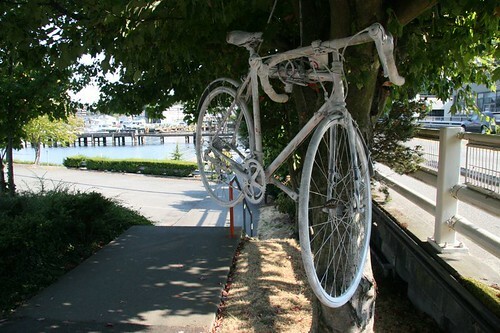 A memorial march from South Lake Union to Volunteer Park on Tuesday will honor a beloved barista who died after a bike crash in the Eastlake neighborhood. Brian Fairbrother was found unconscious after crashing his bike down stairs near 1177 Fairview Ave. N. on Aug. 30. According to the Seattle Times, Fairbrother was breathing when medics arrived. He suffered brain injuries from a lack of oxygen before medics arrived. He was taken to Harborview Medical Center and died there on Sept. 8. 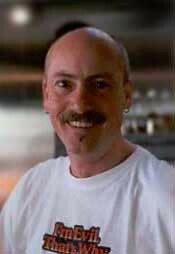 Fairbrother was general manager for Espresso Vivace‘s retail locations and directly managed the Alley 24 store at 227 Yale Ave. N., across from the entrance to REI. He started working at Vivace’s coffee cart on Captiol Hill in 1989. The memorial march will begin at 9 a.m. Tuesday at Vivace’s Alley 24 location and proceed to Volunteer Park where there will be a picnic at noon. Those attending are asked to bring flowers and twine. Fairbrother was apparently riding north on Fairview across from Zymogenetics at about 5:30 p.m. on Tuesday, Aug. 30. He was at a point where the bike trail moves off the sidewalk and onto the street but, for unknown reasons, he continued straight ahead to where the sidewalk turns in to stairs that lead to a pedestrian walkway. That was where he crashed and was found. He was wearing a bike helmet. 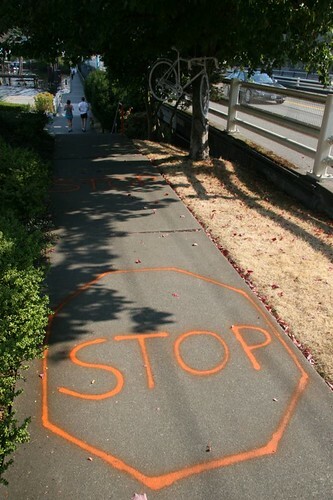 Tom Fucoloro, writing on Seattle Bike Blog, calls this section of the bike trail a “somewhat infamous hazard.” It can be difficult, he notes, especially in bad visual conditions, to tell which direction the bike trail goes. It is thought that the setting sun might have been in Fairbrother’s eyes, causing him to miss the turn onto the street. As you can see in the attached photos, someone has gone to the site and painted stop signs and arrows on the sidewalk to indicate to riders that they shouldn’t go ahead but should turn onto the street bike lane instead. 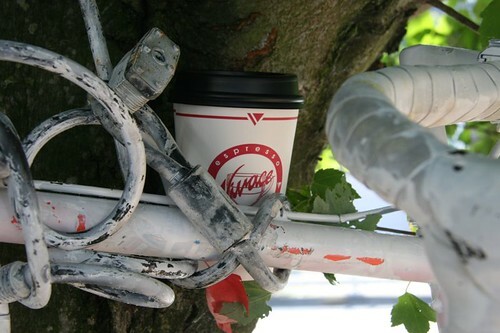 A white memorial bicycle with a Vivace coffee cup tucked into the frame hangs in a tree at the location. Rick Sheridan, a spokesperson for the Seattle Department of Transportation, told the Seattle Times the city hadn’t received complaints about the location or about previous accidents. He said the city will review the area to determine if more signage is needed. 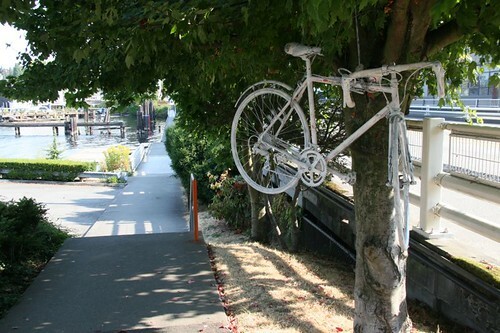 The SunBreak: Did a bike path just kill a Seattle cyclist? This entry was posted in Uncategorized on September 11, 2011 by cdmilton. SUNDAY UPDATE: The state DOT reports the I-5 ramps at Mercer reopened Sunday evening at 7. Husky Football on Saturday: The Huskies will be playing Hawaii at Husky Stadium starting at 12:30 p.m. on Saturday. Expect traffic in Montlake and around the stadium to be snarled from late morning to late afternoon. Metro advises that bus routes 44, 65, 68, 75 and 271 will be rerouted around the stadium starting at 10 a.m. until traffic clears up after the game. You can get more information on the Metro routes at the bus alert page. I-5 ramps closed at Mercer: The I-5 on-ramps at Mercer Street are closed until 5 a.m. Monday as work continues on the Mercer Corridor Project. Fairview is closed between Mercer and Valley streets and Mercer is closed between Westlake and Fairview. Metro bus routes that normally go down Fairview will be rerouted onto Eastlake Avenue. Get more information on the closure and detour routes at the Mercer Corridor Project web page. This entry was posted in Uncategorized on September 10, 2011 by cdmilton. Aug. 30: Auto theft, 2300 block of Boylston Ave. E., 11 p.m.
Aug. 31: Burglary, residential, unoccupied, 2900 block of Eastlake Ave. E., 3:28 a.m.
Aug. 31: Auto theft, 2300 block of Boylston E., 7:43 a.m.
Aug. 31: Accident investigation, 2700 block of Eastlake Ave. E., 6:10 p.m.
Sept. 1: Accident investigation, Eastlake E. and E. Roanoke, 11:26 a.m.
Sept. 1: Auto theft, 1900 block of Harvard Ave. E., 6 p.m.
Sept. 2: Property damage, residential, Fairview E. and E. Boston, 5:15 p.m.
Sept. 4: License plate theft, 1900 block of Eastlake Ave. E., 2 a.m.
Sept. 4: Auto theft, 2200 block of Franklin Ave. E., 4 p.m.
Sept. 4: Noise disturbance, Fairview E. and E. Roanoke, 9:25 p.m.
Sept. 5: Noise disturbance, 2500 block of Minor Ave. E., 1:55 a.m.
Sept. 5: Car prowl, E. Garfield and Franklin E., 12:31 p.m.
Sept. 5: Theft of auto accessories, 2800 block of Franklin Ave. E., 1:16 p.m.
Sept. 5: License plate theft, 1500 block of Eastlake Ave. E., 11:13 p.m.
Sept. 6: Car prowl, Eastlake E. and E. Lynn, 9:10 a.m.
Sept. 6: Accident investigation, E. Blaine and Fairview E., 10:55 a.m.
Sept. 6: Burglary, residential, unoccupied, 2200 block of Eastlake Ave. E., 3:39 p.m.
For the complete map, go to SeattleCrime.com. This entry was posted in Uncategorized on September 6, 2011 by cdmilton. This entry was posted in Uncategorized on September 2, 2011 by ChristyC. The former NOAA base on Lake Union in Eastlake is being offered for sale. After several decades on Lake Union, the NOAA fleet set sale for Newport, Oregon, where it recently dedicated its new headquarters. It’s former base at 1801 Fairview Ave. E., in the south end of Lake Union, is being offered for sale by Kidder Matthews. 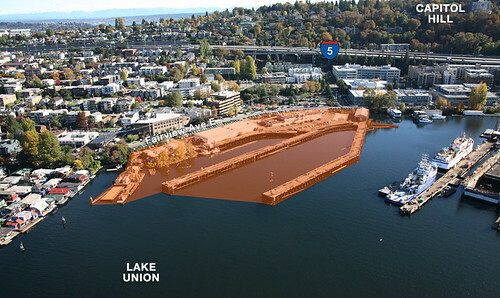 This large 8.5 acre Lake Union property, consisting of approximately 2 acres of upland and approximately 6.4 acres of submerged land with 870 feet lineal feet of waterfront, offers a unique opportunity to acquire one of the largest single parcels on Lake Union. Included with this property are two commercial piers totaling nearly 2,500 linear feet and a commercial wharf of approximately 370 linear feet. Included are an office building (17,100 square feet), a warehouse (12,000 square feet), a metal building (there were two but one was recently taken down), plus docks, piers and wharves. Income from the property is listed as $47,000 a month for the upland portion but nothing from the piers, docks and wharves. For more information, check the sale website. Thanks to SeattlePI.com for first reporting on the sale. This entry was posted in Uncategorized on September 1, 2011 by cdmilton.